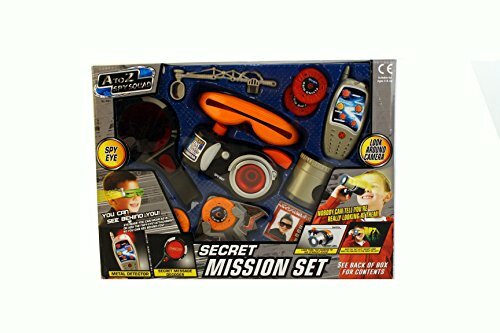 Secret Agent Spy Set Secret Mission Learn To Be A Spy Toy Set | The Best Spy Tech Store Online! Spy Kids See The Latest Technology! Send secret messages with the special transporter gadget and fire your own messages with the disc shooter. List of Contents: x1 periscope; x1 binoculars; x1 camera; x1 message transporter; x1 disc shooter; x5 discs; x1 ID badge; x1 pair of glasses. Everything you need to become a real-life spy! Everything is included for your secret mission! 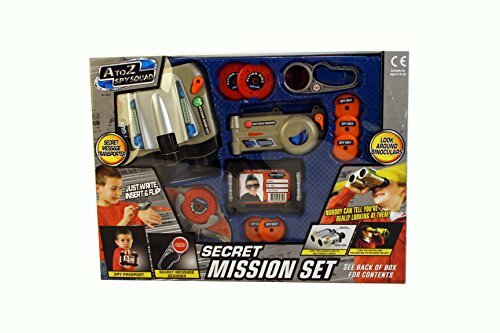 The A to Z Spy Squad Secret Mission Set includes everything you need to become a secret agent. Spy on your friends and family using the look around binoculars and camera. 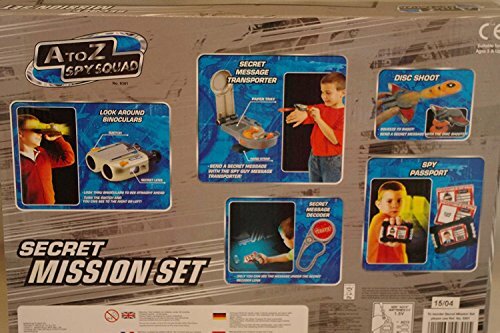 Send secret messages with the special transporter gadget and fire your own messages with the disc shooter. The extending periscope has a pivoting eye for 360 degree vision. Everything is included for your secret mission! List of Contents: x1 periscope; x1 binoculars; x1 camera; x1 message transporter; x1 disc shooter; x5 discs; x1 ID badge; x1 pair of glasses. Everything you need to become a real-life spy! Includes extending periscope with pivoting eye Spy glasses with spy eye attachment so you can see behind you Send secret messages with the special transporter. Warning / Recommendation: Recommended min. age: 5 years. Choking hazard – small parts. Battery warnings and instructions. Uses 2 x AG13 (LR44) batteries. To be used under the direct supervision of an adult!